DomainKing.NG Review Cheap Web Hosting Company in Nigeria. Welcome dear reader, I will be highlighting on domainking web hosting. Domain king is among one of the cheap web hosting in Nigeria, there offer webhosting and domain name registration in Nigeria at cheaper rate. This web hosting platform allows you to pay them on naria. DomainKing has many features that will interesting you, read on the details of their hosting platform are as below. If you are a blogger, web designer or a webmaster in Nigeria, DomainKing is a reliable web hosting company to host your blog or website. Although choosing a reliable host is a very big challenging task. Because if you have any problem with your host then your blog is gone. That is why I have taken my time to make research on a reliable hosting company good for your business. 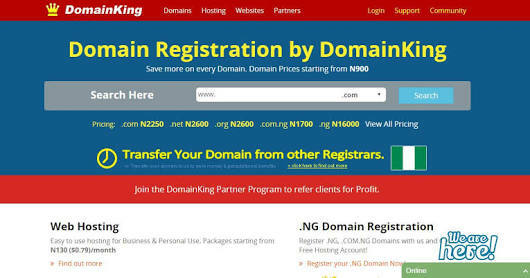 DomainKing.NG is a global government accredited domain registrar & web hosting provider that started offering their services to Nigerians in October last year with their .COM domain for just N499 offer. You probably already heard about them from me or some other bloggers. DomainKing is one of the most reliable & affordable web hosting company out there. It is pretty reliable in terms of Uptime & Support considering their prices. With them you can host your website for as low as N93/month and you are good to get online with your WordPress Blog or your business website. You can even ask their support to install the WordPress for you if you are not sure how to do it. I use DomainKing alot for setting up custom domains for Blogspot blogs of my clients and the interesting part is that DomainKing gives free custom email that can be used for the Blogspot blogs. You can as well register .com.ng or .ng domain names at DomainKing. Okay now let’s talk about the features that you will get if you buy any web hosting plan listed on their website. Free .com or .com.ng domain with their hosting plans for the 1st year. If you are a blogger then I am sure you will enjoy a free domain with hosting. · No Server Overloading which makes the websites hosted on their servers load faster & with better reliability. · Industry standard cPanel that is very easy to use and understand with every hosting plan. So it is very easy to manage your websites at DomainKing. · Softaculous One Click Installer App for installing all basic CMS Softwares like WordPress, Joomla, SMF etc using a single click. · Basic WordPress Support which includes things like Installation & some other issue handling etc. · Uptime Guarantee with all their hosting plans. · Best 24/7 Support that replies to all your questions with definite solutions within a few hours max. · Create Unlimited Sub Domains & Unlimited emails from the cPanel with every plan. DomainKing offers the most affordable web hosting plans to start your website or blog. Their pricing is pretty decent for the amount of features & support that you get. Plans starting from just N93/month, its pretty awesome if you are looking for quality customer support, faster loading & complete value for money. DomainKing also has an affiliate program that lets you earn up to 30% commission on their hosting products when you refer a friend or someone to their website and that person orders their hosting. You can check out their affiliate program if you are a blogger looking to earn money from your blog. I use DomainKing for my blog and clients blog.. you can join me. Hope you are now convinced that DomainKing is a cheap web hosting in Nigeria, Cheapest domain registration in Nigeria, best Domain registration in Nigeria, Cheap Web hosting In Nigeria. If so don’t waste time to share with your friends. CLICK HERE FOR DOMAINKING WEB HOSTING PLANS NOW.